Helping the poor: Daughter of Mercy Sister Evangeline “Vangie” Dunton in Brisbane. SISTER Evangeline “Vangie” Dunton lives amidst the slums of Cambodia, providing for the poorest and most vulnerable, especially children. It has become a life mission for this member of the Daughters of Mercy who is visiting Queensland to thank parishioners for their generous support through Catholic Mission, and to spread the word about her work. Sr Dunton’s story of reaching out and giving to the needy is an uplifting one. In many ways, she shares the vision of St Mary of the Cross MacKillop – trusting in God’s providence and responding to the cry of the poor. 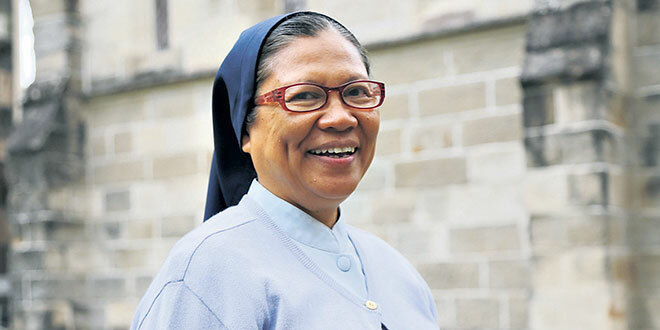 The first of five children, Sr Dunton came from the small Philippines city of Panitan, in Capiz province. After training as a nurse she joined the Daughters of Charity and worked around her homeland before being sent on her first mission to Cambodia in 2001. She began to make significant impact in her local community, starting an eye hospital training and co-ordinating ophthalmic nurses. Sr Dunton realised that success for the hospital – and the community – hinged on becoming self-sufficient in both eye health and nursing practice by training local workers to teach others. Remarkably, only 12 years after setting up the hospital, Sr Dunton handed over the running of the hospital to the local Cambodian staff, and continued training other nurses. For many, it would be mission accomplished but, for Sr Dunton, it was only a step in delivering God’s greater plan. Since 2006, Sr Dunton and the Daughters of Charity have devised innovative projects for urban slum dwellers. They deliver health and nutrition education programs to communities around Cambodia’s capital Phnom Penh, and other urban centres of Takeo and Pailin, near the border with Thailand. Sr Dunton said her goal was simple. “We need to cover the basic needs of the people, so that they can afford to think further down the track – to have ambitions – which they cannot at the moment,” she said. Sr Dunton gave the example of Maly, a 10-year-old child who lives in one of Cambodia’s worst slums on the outskirts of Phnom Penh. Maly’s parents left their rural village in search for work in the city, but as they are illiterate, they struggled to find decent employment. Her mother works every day selling shells on the street, barely making enough money to pay her rent and feed her five children. Her father often leaves the family for long periods of time resulting in Maly’s mother constantly worrying about how she will support her children in his absence. While her parents work, they have no choice but to leave Maly at home all day to care for her four younger siblings. As the children hang around the streets by themselves, every day they face the perils of prostitution, child trafficking, gang crime and drugs. It’s a vicious cycle faced by countless slum dwellers. Thankfully, and with generous support, Sr Dunton and the Daughters of Charity have come up with an innovative program for the masses of children, like Maly, who are not able to go to school. It’s called the Mobile Tuk-Tuk Education Project, which proactively takes learning into the slums. A tuk-tuk is a tiny, three-wheeled auto rickshaw common in Asian cities. They are highly manoeuvrable and can navigate through the narrow, twisting slum streets. One of these slums is Boeung Trabek where Maly always waits with excitement for the tuk-tuk to arrive, and brings her younger sister along, knowing someone can help take care of her sister, while she, Maly, learns her ABCs. Local trained teachers arrive with the tuk-tuk to teach literacy to the children, as well as lessons on health, hygiene, human rights, life skills and cultural development. There are also educational toys provided to keep the smaller children occupied. Meals are also provided so the children can grow, stay healthy and can concentrate on their studies. “Our aim is to reach the illiterate ones,” Sr Dunton said. Sr Dunton sees the positive impact of education on disadvantaged slum kids, and it has become a motivating force for her ongoing mission in Cambodia. 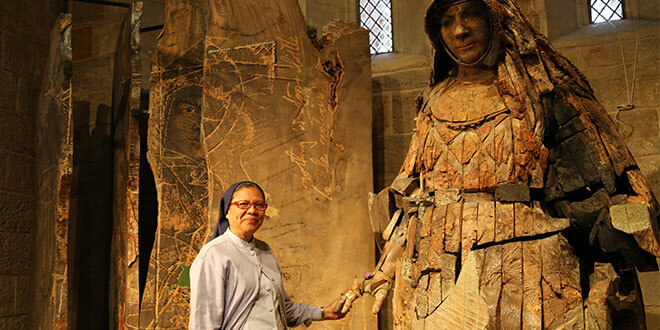 She draws strength from the parable of the Good Shepherd and the mission of the Daughters of Charity. “Whenever I am assigned to a particular ministry, I always remember the words of our founders St Vincent de Paul and St Louise de Marillac,” she said. Supporting the Daughters of Charity work in Cambodia is one focus of this year’s Catholic Mission Church Appeal, and is being promoted through parishes across the Archdiocese of Brisbane from July to September. For more details phone 1800 257296 or go to catholicmission.org.au/churchappeal2016.